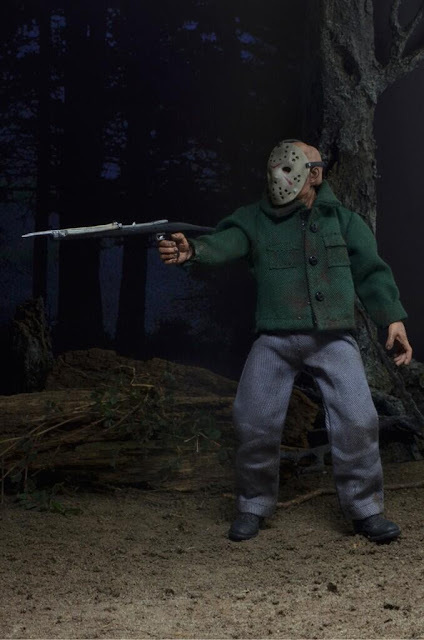 In the middle of July, it was revealed that the popular toy company NECA would be releasing a brand new retro Jason Voorhees 8 inch figure from Friday The 13th Part 3, styled like the old Mego figure dolls from many of our reader's childhood. There was one image released to accompany that news, which was mentioned as a prototype image only. Well now, NECA's Twitter account recently released a cool teaser image from the promotional photo shoot for the Jason 8 inch figure. Keep an eye out for more images and packaging details as they become available. Look for the figure to hit stores this Halloween! This poseable 8″ figure is dressed in tailored fabric clothing similar to the retro toy lines that helped define the licensed action figure market in the 1970s. Jason is based on his iconic first appearance with the infamous hockey mask in Friday the 13th Part 3. He comes with machete and harpoon gun accessories, and is entirely faithful to the movie. Blister card packaging with removable protective clamshell.